The horror film market of India witnesses a substantial event this week. 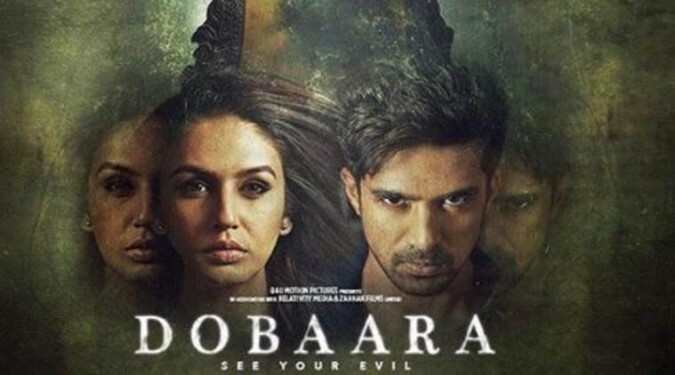 First time in the history of Indian horror films, a mainstream Hollywood flick “Oculus” was officially remade in India by the title of Dobaara ’see your evil’. The Hollywood film by notable director Mike Flanagan was a huge critical and commercial success. But sadly the Indian version directed by Prawal Raman (Darna Mana Hai) failed miserably even after having a terrific storyline to follow. The film tells the story of a brother-sister duo tormented by a mysterious evil mirror their father bought. Now after watching the Indian version, I cannot understand one thing why it was set in a foreign country just like the Oculus? We were adopting the story, and the original film has already been seen by most of the horror fans in India and thus what was the point of developing the story with the characters speaking English, living in the house having a British architecture and so on? How the makers reached to a decision like this as the film struggles to connect with the Hindi speaking audience throughout. The actors in the Hollywood version did a great job; especially Karren Gillian was too good in the character of a protective sister and child actors Annalise Basso and Garrett Ryan were spectacular as the innocent brother-sister. In Indian version both Huma qureshi and Saqib saleem were actually hostile to the psychology of the characters. The child actors in Hindi were below average and Lisa Ray and Adil Hussain were mostly screaming in the film trying hard to be in tune with the emotional depth of their characters. There are also too much speaking in the film while the storyline in the original Hollywood film mostly relies on the psychological atmosphere but useless monologues and unceasing talking killed the atmosphere totally. The Indian version is a box office disaster too and definitely a big opportunity for the Indian horror film market has gone totally wasted.